Monkey and I have always considered ourselves cookie connoisseurs! Prior to going Whole Food Plant Based, we created an assortment of amazing cookies which we sold during the holidays. Monkey and I would go all out and bake ourselves into exhaustion. It was a ton of work and totally worth it as we both love to create beautiful food and desserts. It is our creative outlet (among a few other things), but cooking and baking is at the top of the list. We have become hyper critical of our own baking especially when it comes to cookies and desserts. We want to make the best darn cookies and desserts possible. The WFPB diet forced us out of our comfort zone. We really pushed ourselves as bakers and still push ourselves to create yummy treats, we are excited to share this amazing success with you. 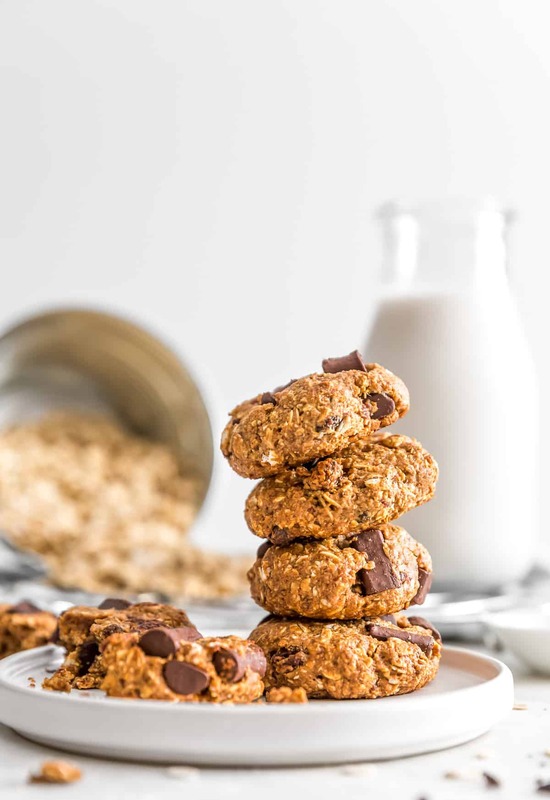 We just know you are going to love these tasty cookies too. This recipe is naturally gluten free (YAY!) with the use of almond flour, which is awesome for those who need to be gluten free. The cookies are delightfully soft and chewy. They are lightly sweetened with pure organic maple syrup. Maple syrup, the sweet mother of WFPB compliance, we love you so. LOL Each cookie is topped with a beautifully glazed pecan, sweet perfection. Monkey and I danced a little jig when we pulled these beauties from the oven as they smelled divine, full of cinnamony goodness. The kitchen was warm and toasty as the oven radiated heat on this very cold day. It immediately transported us back to a time when we used to bake thousands of cookies. TP was hovering nearby looking to swipe a cookie, even though he insisted that he was only “mildly curious” about our new cookie. Yah right TP, “mildly curious”? We know that you are a human cookie vacuum cleaner – LOL. We never know where he puts it all. Sooooo unfair! Now, down to the details! First tip is putting the dough in the freezer. This allows the dough to rest, get cold, and firm up just enough to scoop and make delightful little dough balls, make sure you don’t skip this step. Then using a small cookie scoop, scoop the dough and roll into balls – the cookie scoop helps keep the cookies uniform for even baking. Plus, I don’t want to forget to mention our baking sheet; we love using our insulated baking sheets. The beauty of using an insulated baking sheet is that the added insulation guards against over-browning cookie bottoms. You can find them very reasonably priced on Amazon. They are a nice tiny investment if you plan to make these cookies (or any cookies) often. We have found that if you cover a small juice glass with plastic wrap, then press down to flatten the cookie dough, this helps keep it from sticking. 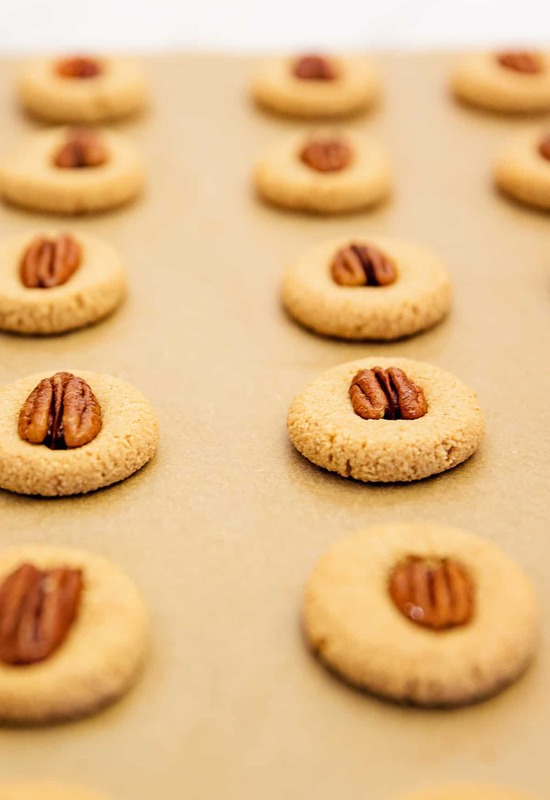 Once out of the oven, prepare the glazed pecans, then quickly and carefully (so not to burn yourself), place a warm glazed pecan in the center of each cookie. See the recipes notes for full details. The lightly glazed pecan halves really dresses up these cookies nicely. 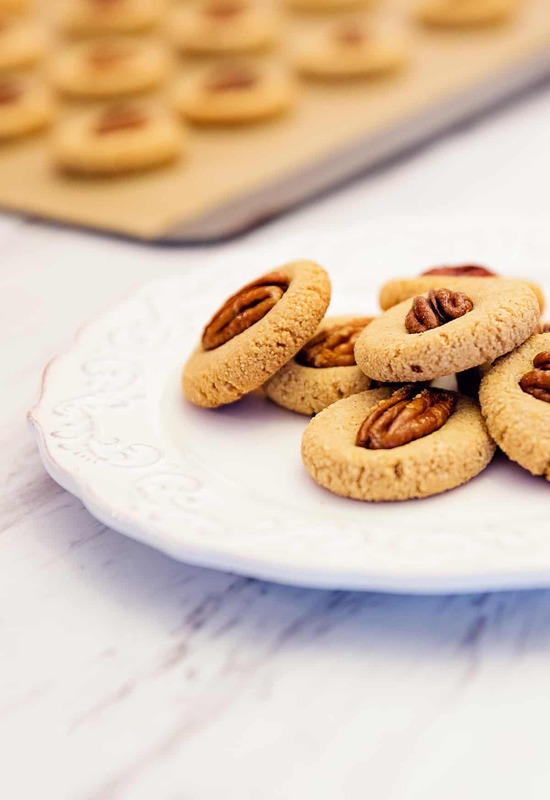 We suggest that you do not try to make the glazed pecan halves while the cookies are in the oven, even though the temptation was there for us as well. 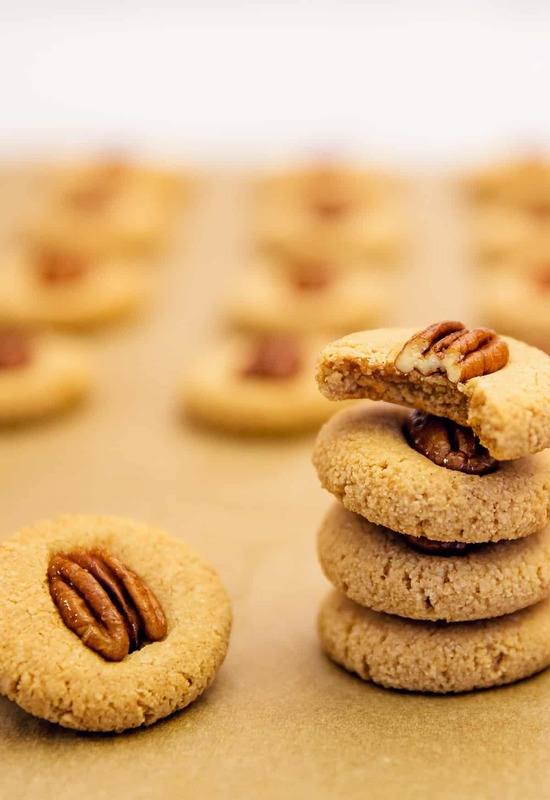 The reason is because the glazed pecans deserve your full attention, and you need to apply them individually to each cookie while they are still warm and sticky. Otherwise, they may fall right off the cookie. Your patience will pay off, trust me. Old fashioned maple pecan cookies also freeze well! We froze some cookies just so we could do a taste test later after they were frozen and thawed. We were blown away by the taste test as there were no discernable differences between the two. You simply could not tell the difference regarding taste or appearance – SUPER BONUS! This is great if you want to make a batch, freeze them, and only take out a couple at a time for portion control. Or keep a batch in your freeze for when you have guests over, just pull some out, thaw, and enjoy. Ameera here, and I absolutely love this cookie! 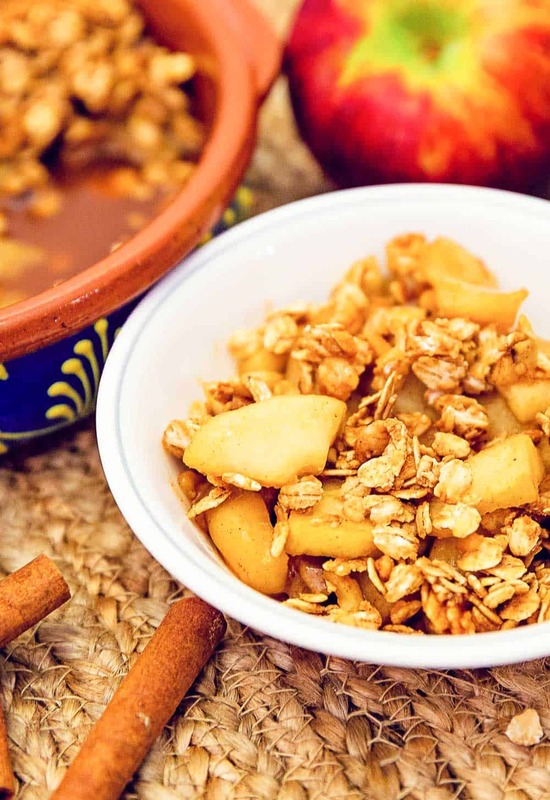 It is complete perfection in its simplicity with just the right hint of cinnamon yummy goodness. Plus, they are so pretty. We were thrilled by their soft and chewy texture. I named them “old-fashioned” simply because the maple syrup reminds me of a time many years ago, when I was very young. Our family visited a farm owned by family friends, Joe and Anita. They were tapping maple trees and making maple syrup. You make maple syrup by heating maple sap and burning off the excess water from the maple sap. Because of the large quantities of steam generated, you make it outdoors. We spent many hours in the brisk cold, but it was a lot of fun standing by the huge bonfire and taking turns stirring the maple syrup. I loved the sound of wood crackling from an open fire and the smell of the wood burning on the bonfire. It was very cozy next to the fire despite the cold. This memory has stuck with me throughout the years. Simpler times. In a medium sized mixing bowl, add all the dry ingredients, almond flour, baking powder, baking soda, cinnamon, and sea salt. Stir the dry ingredients to combine. Slowly add the maple syrup while stirring to combine. Place your hands in the bowl and form the dough into a ball, then place the ball onto a sheet of plastic wrap and cover. Place the plastic wrapped dough into the freezer for 25 minutes. After 25 minutes has expired, remove the chilled dough. Using a small cookie scoop (holds approx. 2 teaspoons of cookie dough and yields a 2-inch cookie) scoop some cookie dough into the cookie scoop. 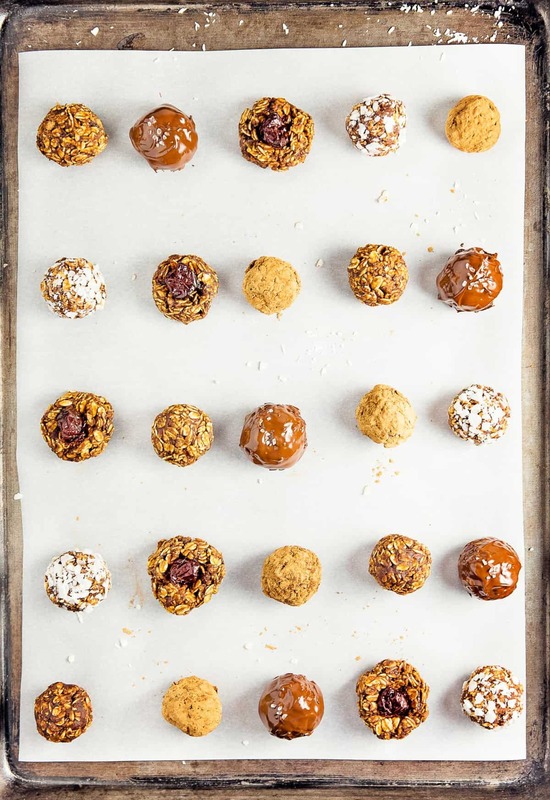 Roll the scooped cookie dough into a ball and place on a large parchment paper lined cookie sheet. Continue until all the cookie dough has been shaped into balls. Using slightly dampened fingers, press each cookie down into a round slightly flattened disk. The cookies should have some room between them, but they do not expand much. 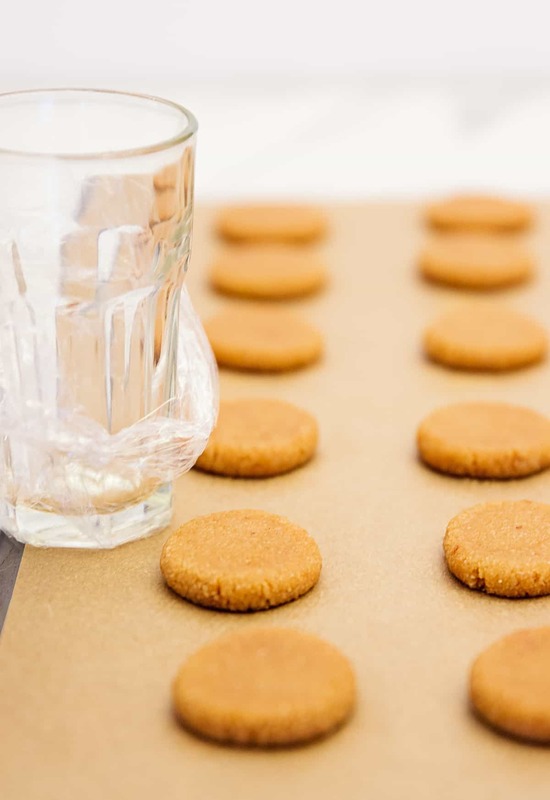 Then place some plastic wrap over the flat end of a small juice glass or similarly small glass, then further flatten each cookie down to approx. ¼ inches. The cookies are slightly sticky and the plastic wrap preserves the shape of the cookie without sticking. Place the cookie sheet into the oven and bake for 13 minutes. 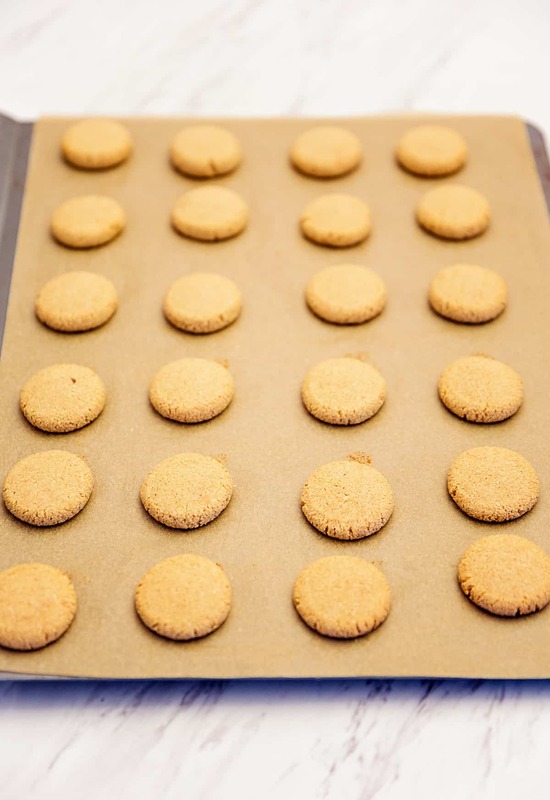 After 13 minutes, remove the baking sheet and allow the cookies to cool on the baking sheet. Do not remove them yet. Now make the glazed pecans. Add 30 pretty, undamaged pecan halves into a nonstick skillet and heat them over medium heat for 4 to 5 minutes. Cover a plate with plastic wrap. Set aside. Move all the pecans to the center of the skillet. Then drizzle 1 teaspoon of maple syrup over the pecans. The maple syrup should sizzle and bubble up as it hits the skillet. Move the pecans away from the center of the skillet as we do not want them to stick together. Gently move the pecans gently around the skillet to coat them with the maple syrup. Make sure all sides are coated. Add a tiny more maple syrup if needed. Carefully remove the pecans onto the plastic wrap coated plate, separating them so they don’t stick to each other. Take each individual glazed pecan (while it is still warm and sticky) and press it firmly into the center of each cookie. Press just hard enough to make it stick firmly to the cookie. Continue until all of the cookies have a beautiful glazed pecan in the center. * Plastic Wrap Juice Jar: The cookie dough is somewhat sticky. Covering a small juice jar or similar jar in plastic wrap will prevent the cookie from sticking to your hands. 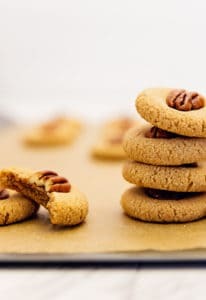 *30 pecan halves: The reason we use 30 pecan halves vs the exact amount of cookies is because sometimes the pecan halves become stuck to each other and get damaged. We like to have a few extra just in case this happens. The left overs can be consumed as a delicious treat. *Plastic Wrap covered plate: The reason we cover a plate with plastic wrap is because the glazed pecans are sticky, and you want them to be sticky so they adhere to the cookie. By using plastic wrap, you can place the warm pecans onto a plate without them sticking to the plate. *Cookie Sheet: We have found that an insulated cookie sheet works best; however, any baking sheet will work equally well. 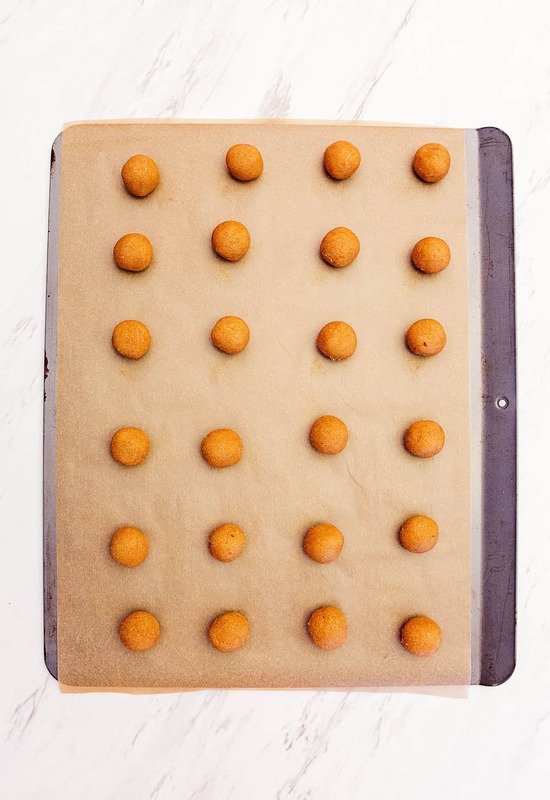 An insulated cookie sheet protects the bottom of the cookies from becoming overly brown. *Small Cookie Scoop: We love cookie scoops as it allows us to make uniform cookie sizes; however, using a spoon will work equally well. Storage: Cool complete, store in an airtight container. They freeze very well. Hi Kahlee! Thank you so much! <3 Yay! So excited that you will be trying them out! We hope that you enjoy them as much as we do!